Kristi is a busy woman - she is a wife, mommy to two precious little ones, she has a full time job AND she is the co-owner of His & Hers Photography. Kristi has never been a "girly girl" - she was always busy playing sports and makeup has never been a priority for her. When she asked me to do her makeup for her maternity photos was I was very excited to work with her. Her very natural style is like many of my makeup clients. I meet many of these clients after they have had unsuccessful trial runs with other artists. I rarely get to see their previous makeup looks and I get very few details about their experiences, but I am frequently told their makeup was too thick and too heavy. Since I was going to be Kristi's makeup, I was hoping she would be up to doing her makeup a few more times and photographing her makeup in various stages and she said "Yes." 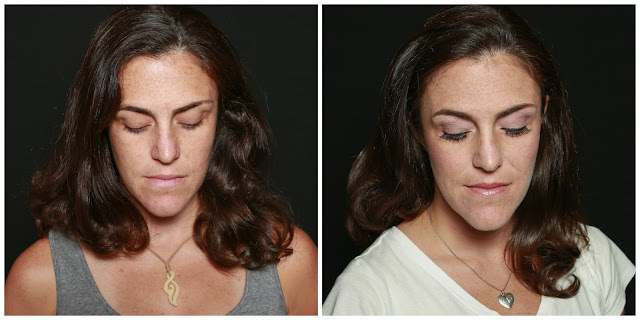 Oscar, Kristi's husband and fellow business partner, agreed to photograph her makeup. 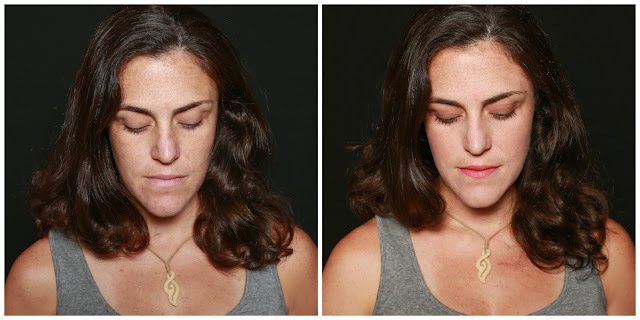 This blog has Kristi's thoughts about her experience and the accompanying photos. Kristi's thoughts and opinions about this experience are her own. I am hoping the photos below will show you that there is a difference between doing your own makeup and using a makeup artist. I also hope you can see there is a big difference in makeup artistry. You can listen to Kristi, Oscar and Keri Ann talk about this project by clicking HERE. This is Kristi without makeup. I think Kristi has good skin with very few blemishes. She also has quite a few freckles - she's not a huge fan of those freckles, but Oscar loves them [ladies, your men love your freckles, so embrace them]. Kristi actually thinks she has patchy looking skin and struggles with blemishes on and off. 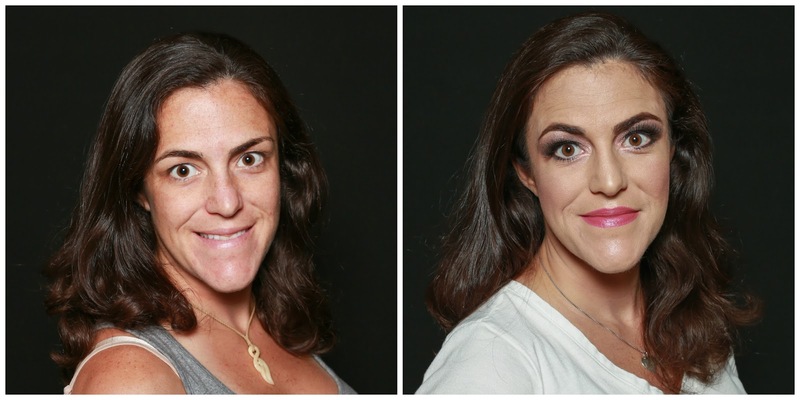 This is Kristi before and after doing her own makeup. 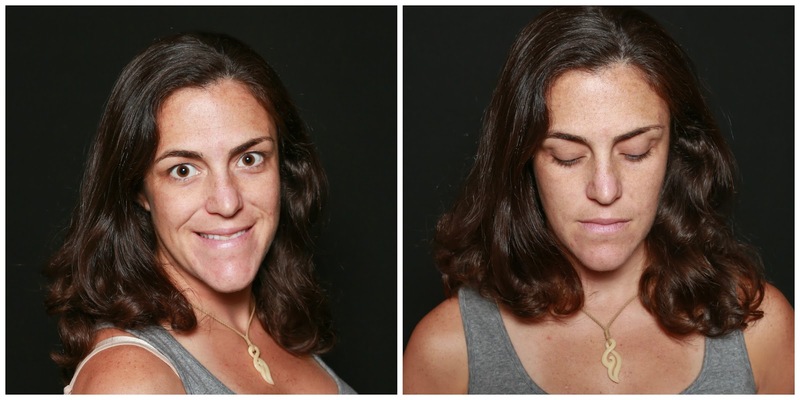 Kristi says she wears light makeup on a daily basis to even her skin tone. I had to buy a few things for makeup, but for the most part there wasn’t money spent. I can do it whenever I’m ready and head out the door. about other people’s germs being on the makeup. [Keri Ann] did my makeup. I was able to implement some of the things I observed in doing my own makeup. by someone who doesn’t own much makeup or know what they are doing. I didn’t even attempt to do them for myself. Therefore no lashes got done, which is a bummer because that was probably my favorite part. This is Kristi before & after she went to a brick & mortar location to have her makeup done. Kristi & I worked together to choose a local brick & mortar chain with locations all over greater Houston. The location we chose had a licensed salon & offered hair and other skin services. never wears makeup and she was getting makeup done for her maternity photos. show up, get it done and leave. It was not that much money for makeup and lashes. That said, I think you get what you pay for in this case. It is nice to be able to tag team makeup and hair if needed. I ended up with makeup that was beyond overboard considering my "natural" style. It also looked nothing like the sample photo I showed the MUA. By this I mean that there wasn't an attempt to talk to me, to chitchat. I know we don't pay for the conversation, but talking is part of the fun to me. (i.e. put on eyelashes, use concealer, eyeshadow, etc). falling off in the car on the way home. 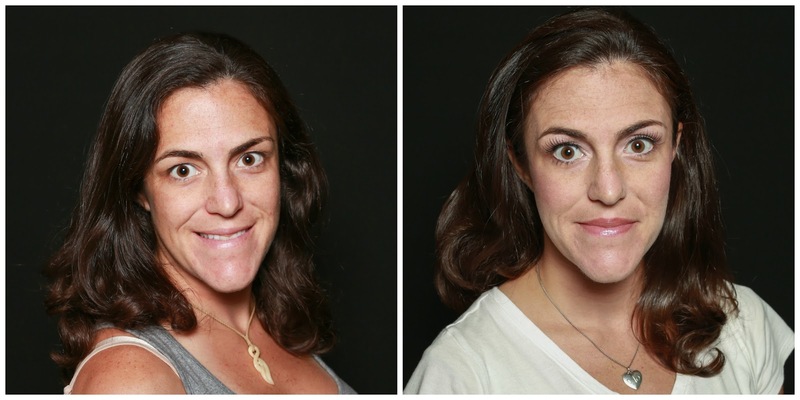 This is Kristi before & after Keri Ann did her makeup. It was very important to Kristi and Oscar, that Kristi look like herself. She wanted a very soft & natural makeup look for her maternity photos. It's obviously the most convenient experience to be at your house, have your MUA show up & get to business. I could also get the input of my husband and family during the process. There was a personal aspect to the appointment. 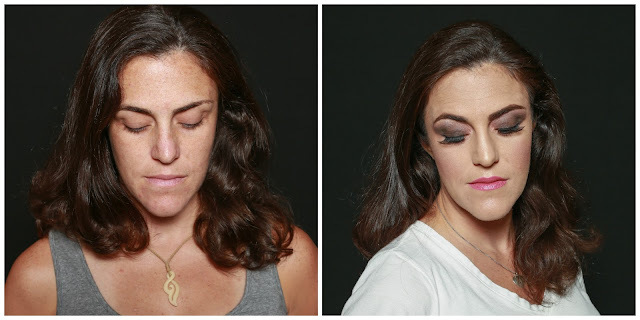 I don't know if it is common practice to show the client the makeup throughout the process, but it calmed my nerves to see bits and pieces of how it was going in the mirror. Not to mention that I felt comfortable enough to ask what this product was or why you do this instead of that...Perfect for someone who is VERY new to makeup. Even before the appointment, I was sent an email giving pointers to get the most out of the appointment, including drinking plenty of water, maintaining your regular face-washing routine, etc. From the start of the appointment, there was a client information sheet to get to know me (including allowing me to note my skin sensitivity, my preferences, etc). Then throughout the appointment, Keri Ann very sweetly put up with my toddler and mother-in-law all the while making me look great! Because the time was taken to get to know me and my personal style, I got the right balance of the sample photo I showed her and what I would actually wear without looking fake. It was definitely a less inexpensive version. But again, I think you get what you pay for in this situation. For some, I could see this being a con. comfortable inviting someone they don't really know into their home. To see how Kristi's makeup turned out for her maternity photo session, please click HERE. For more information about His & Hers Foto, please click HERE. Thank you so much for such an awesome experience... not to mention beautiful makeupfor my maternity pics! You are such a sweet and talented person! Thank you, KAllen! I enjoyed working with you and would be more than thrilled to do your makeup again (and without the publicity)! Getting your makeup down can be fun, but I think the MUA definitely needs to consult the client to help decide on a look. Not feeling like yourself when you get your makeup done isn't beneficial. You did such a great job enhancing her natural beauty. 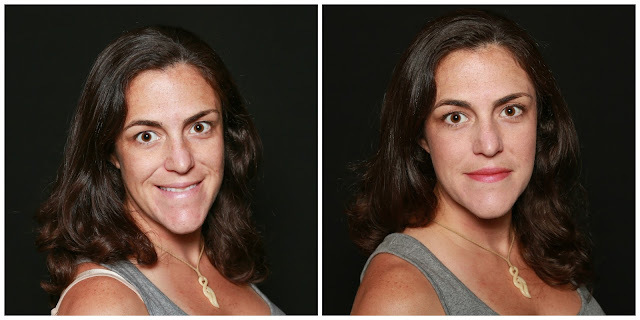 Love the comparison photos, and I love the natural look (which I don't have naturally). Thanks for sharing! Thanks, Shelia! I appreciate you stopping by for a look! I love how detailed you were about Kristi and her needs going into this blog post and absolutely knew that the personal touch would have to be a Pro that she listed as far as having her makeup done with you! Love the comparison! Getting to know the client and her style is so important! This article nailed so much for me. I'm a local wedding and event planner who gets asked all the time to be a subject for makeup artists. I've experienced all kinds of makeup artists. I will note that I have acne, and I get really concerned about the cleanliness of the brushes. I break out very easily and wouldn't want to have someone else's oils on my face. During my session, Keri Ann only used clean and new brushes for everything. I really appreciated that. She also asked what I was wearing for my shoot and the overall look/feel I was going for. She nailed everything from the eye colors to the lip. I was so impressed. The lashes were perfect and I had a very natural look in my photos. Like the photos of the of the brick and mortar above, I had had my makeup done by another artist and it was HEAVY, especially on the blush and eyeshadow. I was embarrassed seeing people in public-- even grabbing a tissue to wipe a lot off before my shoot. Keri Ann did my makeup perfectly. So much so, that I was completely okay wearing it in public after the shoot. And it still looked fantastic in the photos! I loved how comfortable Keri Ann made me feel. We chit chatted as she showed me her color palettes. She even would hand me the mirror frequently and ask if I liked the look so far. It made me feel comfortable enough to tell her if I wanted more or less shadow, more or less liner, and choose my lashes. I really loved having Keri Ann do my makeup. THANK YOU for your testimonial! I loved doing your makeup!!! Keri Ann I love how you did her makeup! It's so beautiful and natural. All you had to do was enhance her natural beauty. I hate when MUAs don't consult the client for what they're actually looking for. Great job on a beautiful, personalized experience!